Five years ago, astronomers knew almost nothing about Gamma Ray Bursts. Now, a team of observers using the National Science Foundation's Very Large Array (VLA) radio telescope has used a gamma-ray burst as a powerful tool to unveil the nature of the galaxy in which it occurred, more than 7 billion light-years away. "We believe that gamma-ray bursts may become one of the best available tools for studying the history of star formation in the universe," said Edo Berger, a graduate student at Caltech. Berger worked with Caltech astronomy professor Shri Kulkarni and Dale Frail, an astronomer at the National Radio Astronomy Observatory (NRAO) in Socorro, New Mexico, to study a gamma-ray burst first seen on July 3, 1998. The astronomers presented their results at the American Astronomical Society's meeting in Pasadena, CA. "For the first time, we've seen the host galaxy of a gamma-ray burst with a radio telescope," Berger said. 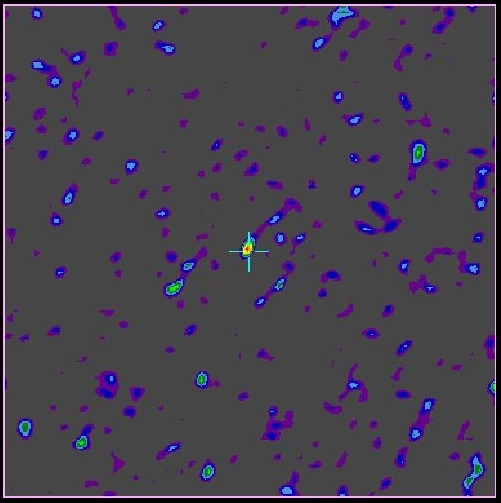 "Previously, gamma-ray-burst host galaxies have been seen with optical telescopes, but detecting this galaxy with a radio telescope has given us new clues about the nature of the galaxy itself -- clues we couldn't have gotten any other way," he added. For example, based on optical-telescope studies, astronomers estimated that new stars are forming in the host galaxy at the rate of about the mass equivalent of 20 suns per year. However, data from the radio observations show that the actual star-formation rate is 25 times greater -- the mass equivalent of 500 suns per year. "With the VLA, we are seeing the entire region of star formation in this galaxy, including the areas so dusty that visible light can't get out," said Frail. Gamma-ray bursts are the most powerful explosions since the Big Bang. First discovered in 1967 by a satellite launched to monitor compliance with the atmospheric nuclear test ban treaty, gamma-ray bursts remained one of astronomy's premier mysteries for 30 years. For three decades, astronomers debated whether the explosions were close, in our own Milky Way Galaxy, or far, in distant galaxies. In addition, a plethora of theories attempted to explain the bursts, but a lack of observational data prevented scientists from choosing among the theories. Optical and radio telescopes first spotted the "afterglows" from gamma- ray bursts in 1997. It was quickly determined that the explosions are occurring in very distant galaxies. Subsequent observations, most astronomers believe, have narrowed the theories down to two: either the explosions are the result of pairs of old, superdense neutron stars colliding with each other or are the death throes of young, very massive stars. "This burst in 1998 came from a region near the center of its host galaxy, where star birth is occuring at a rapid rate. This supports the theory that gamma-ray bursts come from the death explosions of very young, massive stars," said Kulkarni. The burst, known as GRB 980703, was detected by a satellite on July 3, 1998, and the VLA first observed it a day later. The astronomers continued to observe the object with the VLA at intervals over the next 1,000 days. This is the longest period over which a gamma-ray-burst afterglow ever has been observed; the previous record-holder was a burst in 1997 that was followed with the VLA for a period of 445 days. "The afterglow of the burst kept getting fainter with time, but we then noticed that the intensity of radio emission was leveling off. We realized that the burst afterglow was still fading, but what was remaining steady was radio emission from the galaxy itself," Berger said. This allowed the scientists to study the characteristics of the galaxy, and of the region within the galaxy where the burst occurred. They concluded that the gamma-ray burst occurred near the center of the galaxy in a region where the galaxy is experiencing its maximum amount of star formation. "If, as we believe, gamma-ray bursts come from the super-explosions of massive stars, they can help us trace the star-formation history of the universe," Berger said. "The gamma rays from these bursts can penetrate the dust in star-forming regions and allow us to study galaxies and the tenuous material between galaxies at great distances," Berger said. 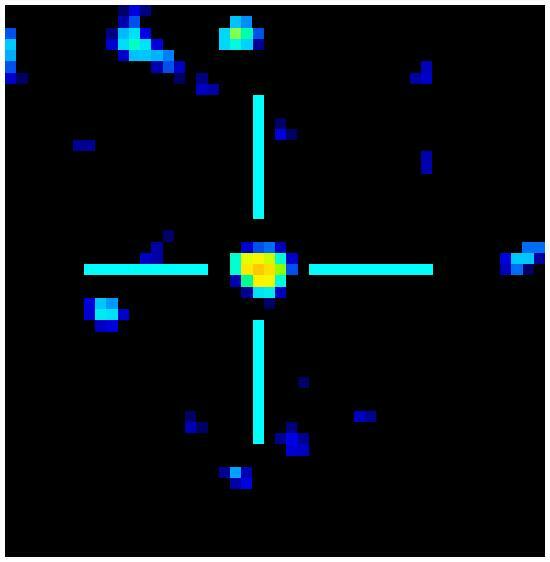 "This means that gamma-ray bursts may provide a unique tool for studying star formation at a wide range of distances, and thus for understanding how star formation rates may have changed through the history of the universe," he added. By studying "starburst" regions of intense star formation in distant galaxies where gamma-ray bursts have occurred, astronomers can compare their properties to starburst regions in more-nearby galaxies. The distant galaxies are seen as they were when much younger than today, so these comparisons will help astronomers understand how the process of stellar birth in galaxies may have been affected by the passage of billions of years. "Gamma-ray bursts can serve as beacons, pointing us to regions of intense star formation in very distant galaxies," Kulkarni said. "With the planned expansion of the VLA, which will improve dramatically its ability to detect the host galaxies of these bursts, we will be able to make even more detailed studies of galaxies even more distant," said Frail.